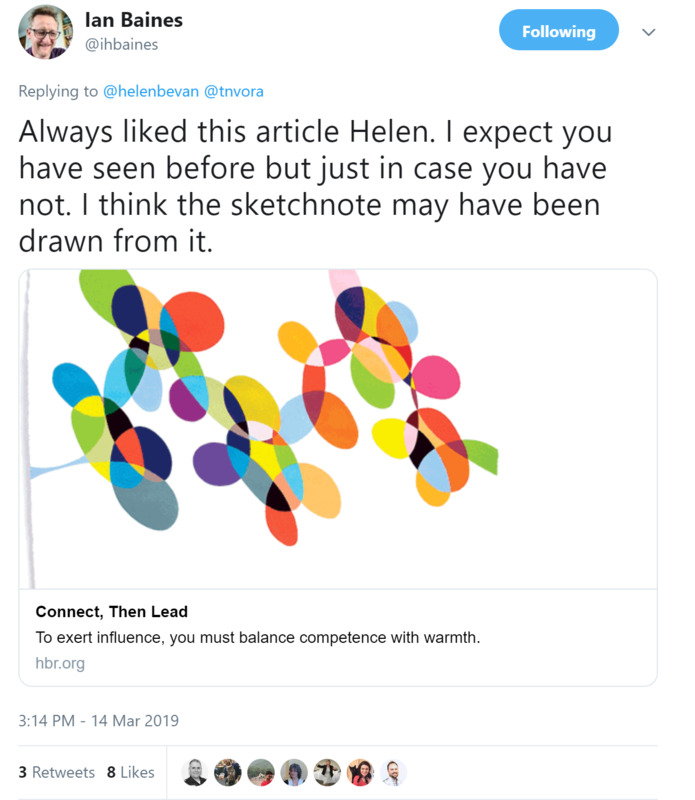 The Horizons team features many influential Twitter users. 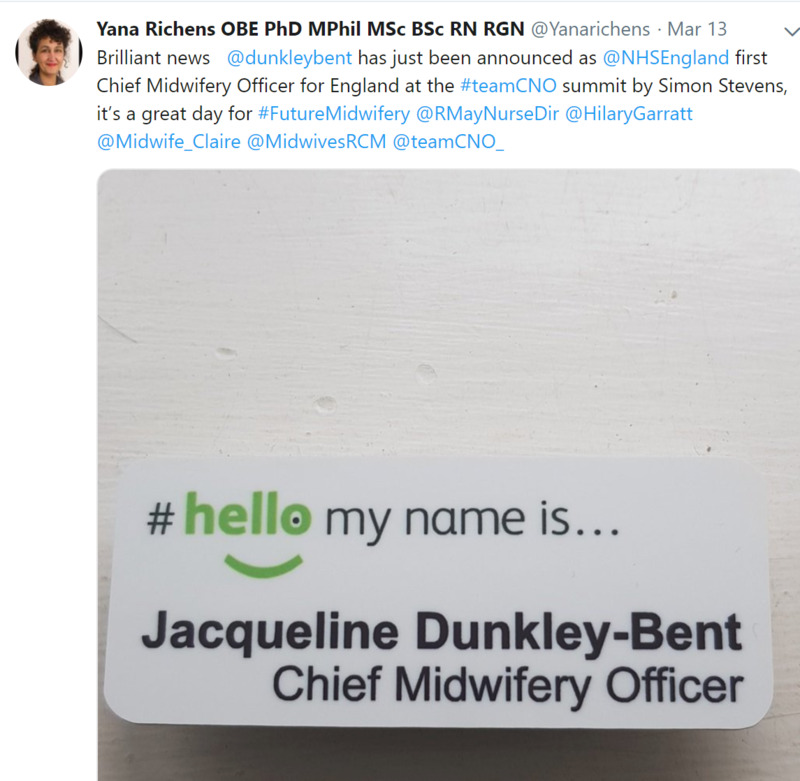 This curates a wealth of insights, knowledge, and information about transformation in health and care from other thought leaders across the world. 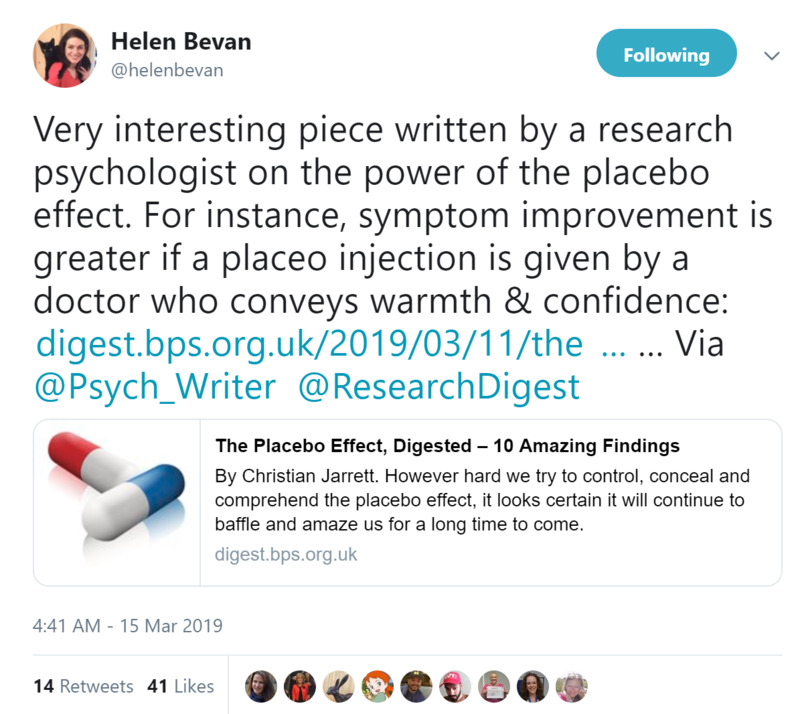 (Tip: to read an article or watch a video mentioned in a tweet, click on the red text. 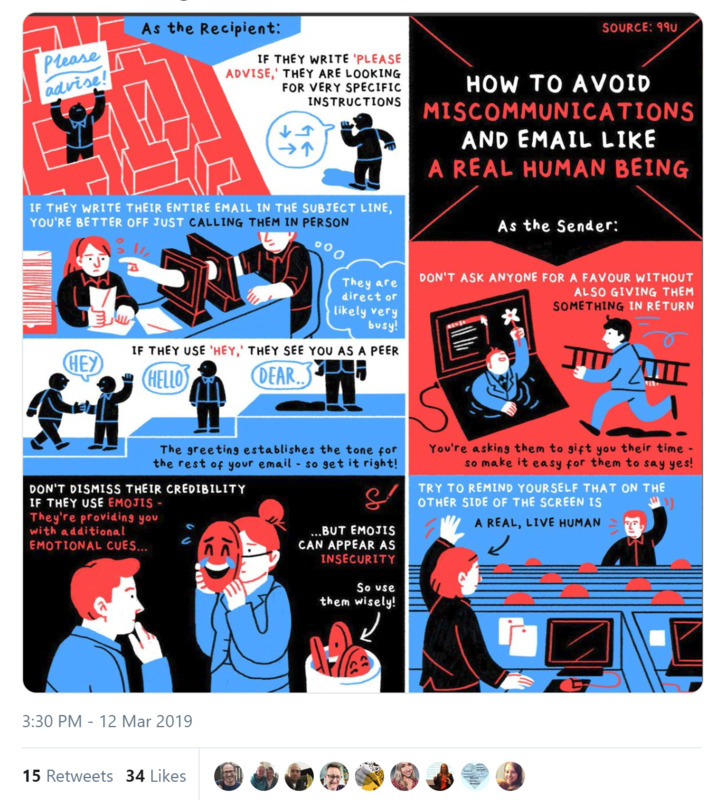 To view the original tweet, click on the image). 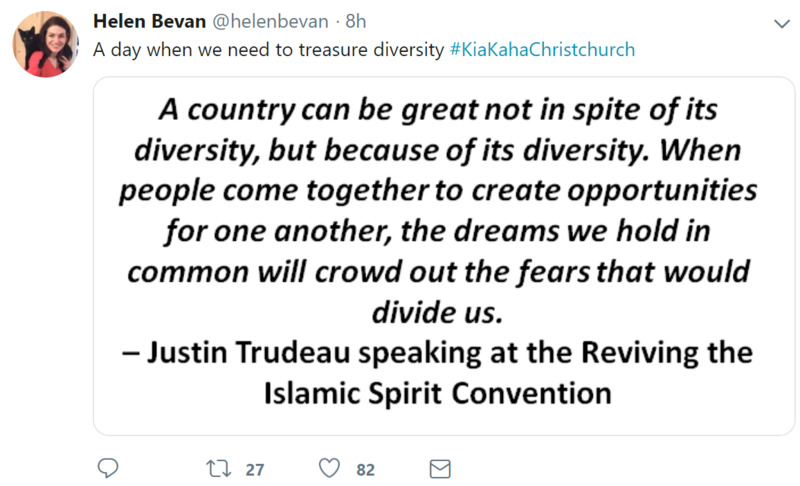 Events in New Zealand remind us that we need to treasure diversity. 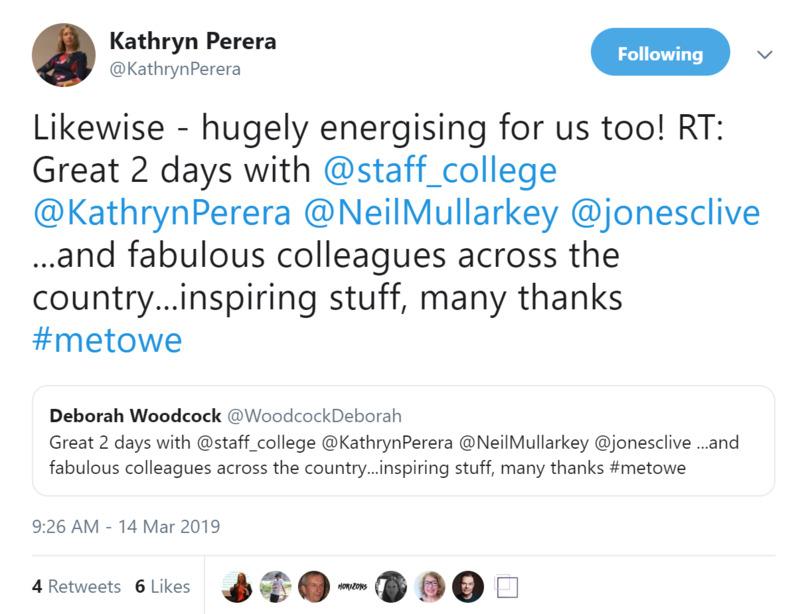 Kathryn was invited as guest lecturer for the Staff College Aspirant Directors programme, which is senior leaders across the country aspiring to be for children's services directors. Sasha facilitated the annual un-meeting for Radiotherapy Quality Special Interest Group (RTQ SIG). Several Liberating Structure techniques were used for this workshop. 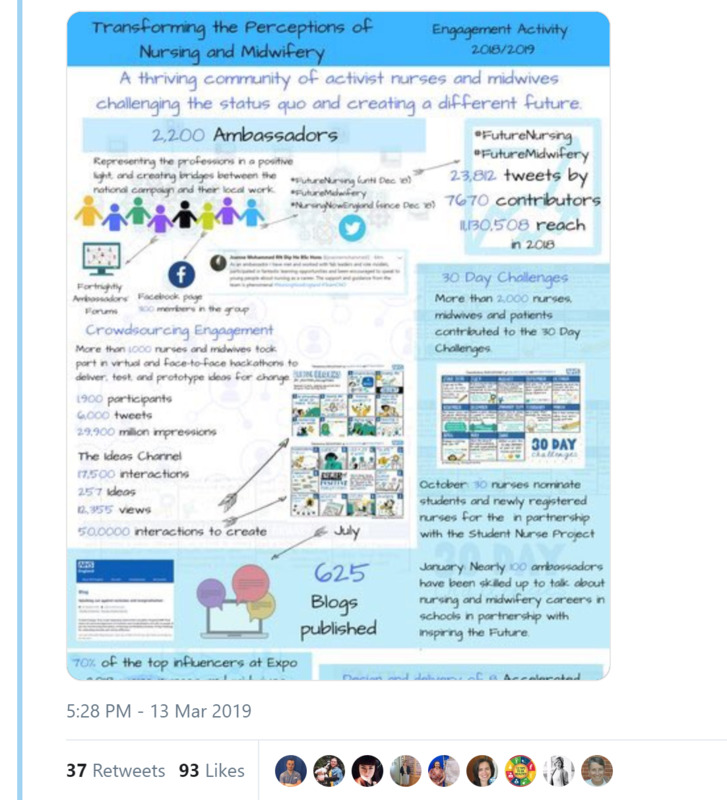 For more information see #RTQSIG2019. 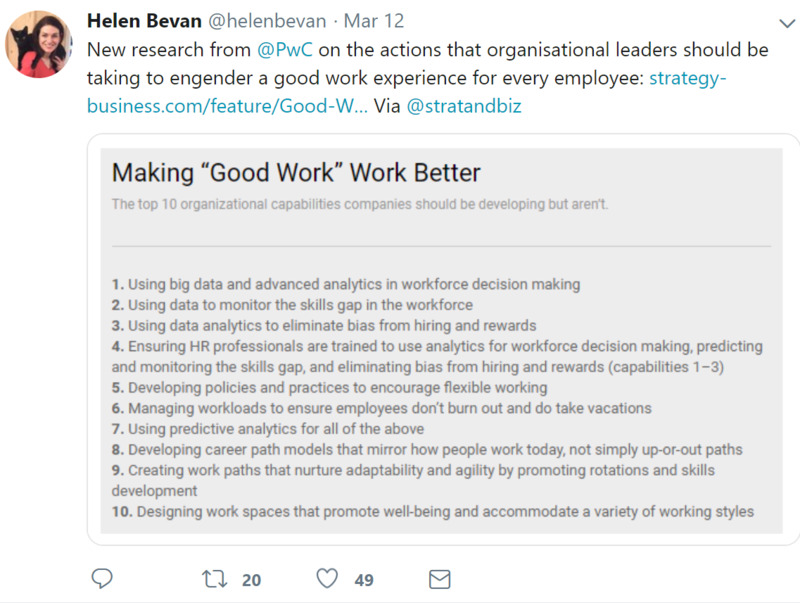 Helen was invited to Lean Island Annual conference in Iceland as a keynote speaker. 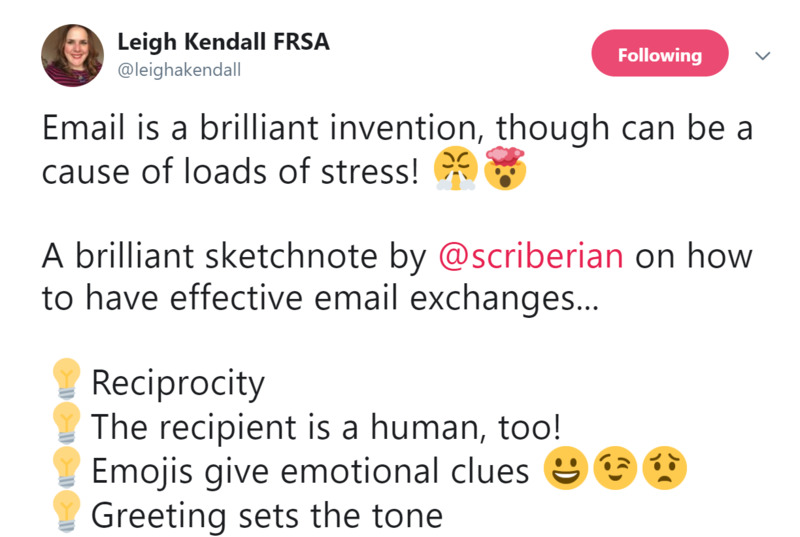 She delivered a workshop on how to be a brilliant agent. 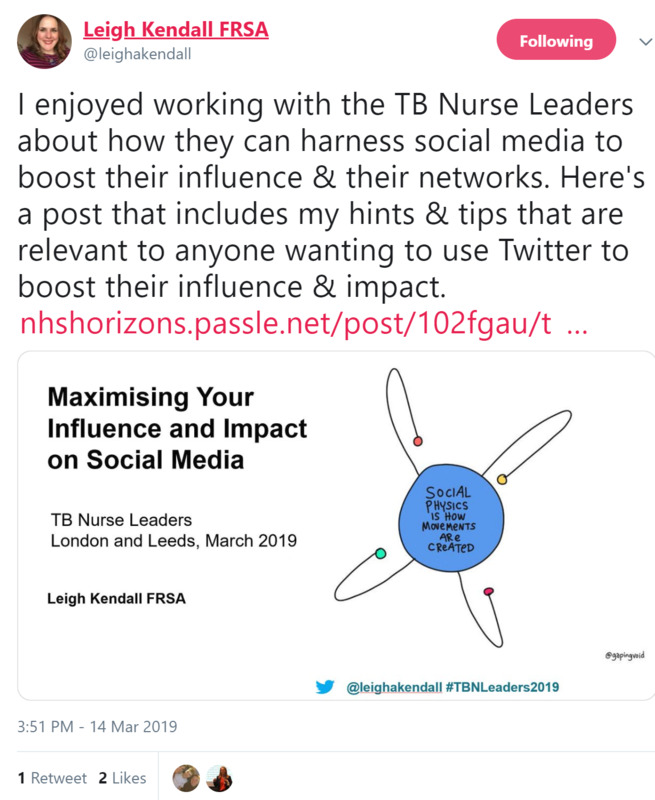 Leigh delivered a masterclass at the TB Nurse Leaders conference; read her blog on how to use Twitter to boost their influence and impact. 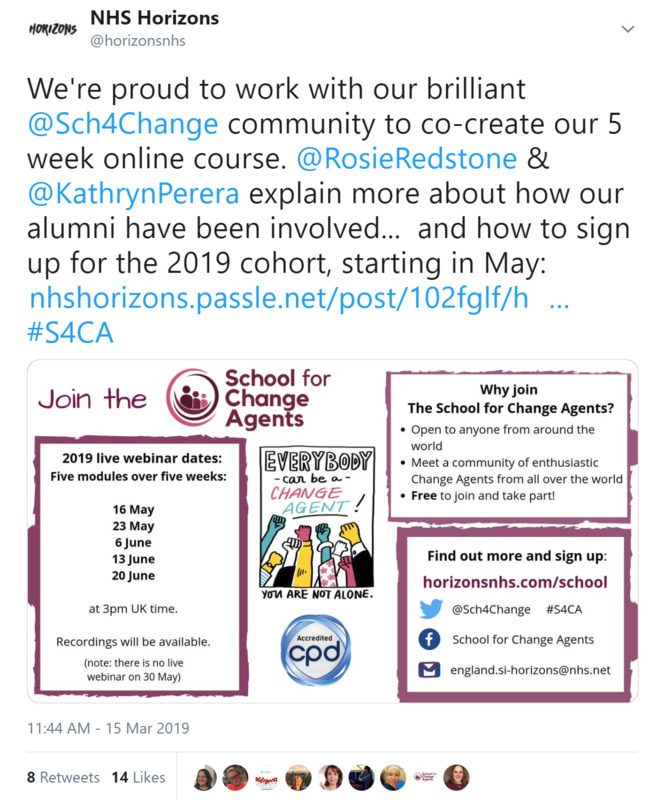 We're proud to work with our brilliant School community to co-create the course. 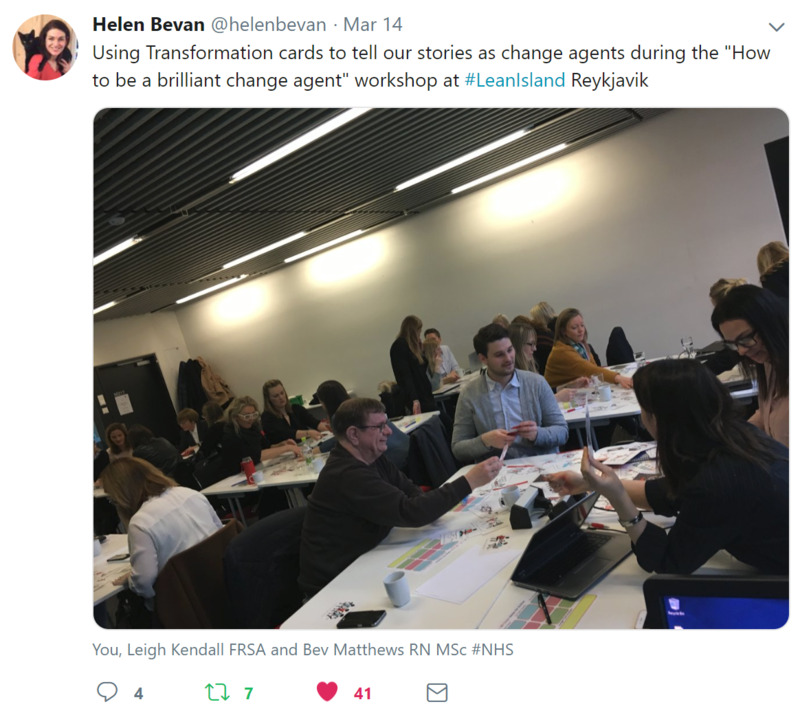 Find our how co-production with alumni shapes the School for Change Agents; and sign up for the 2019 cohort here. 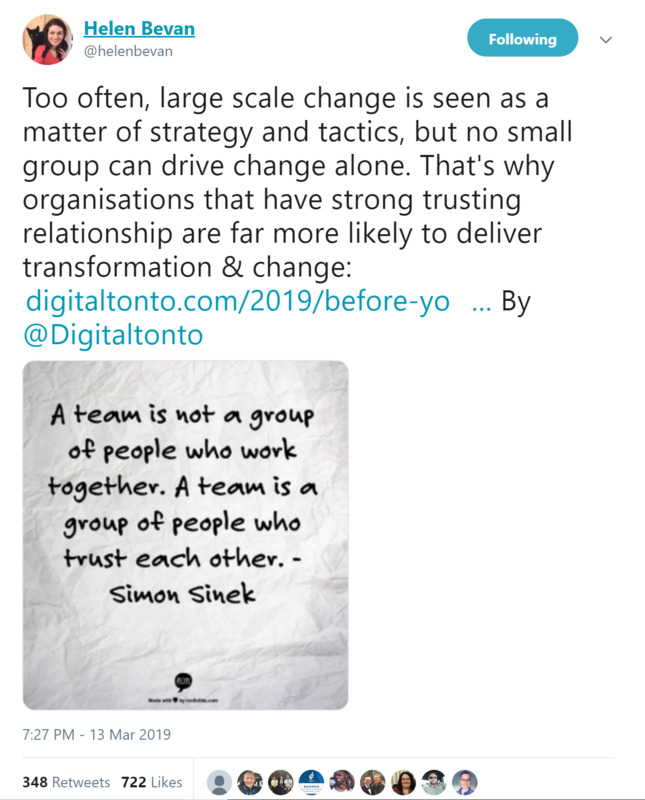 Too often, large scale change is seen as a matter of strategy and tactics, but no small group can drive change alone. 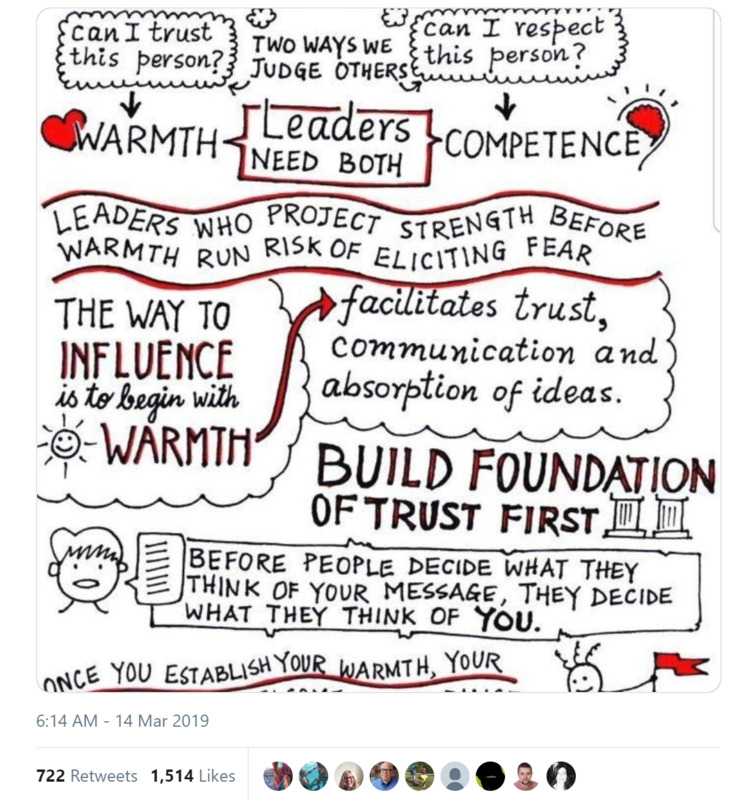 That's why organisations that have strong trusting relationship are far more likely to deliver transformation & change. 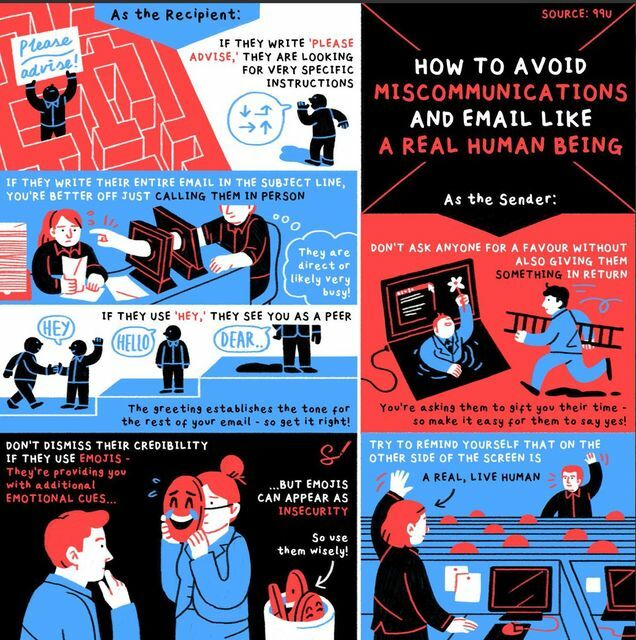 What skills will we need most in 2030? 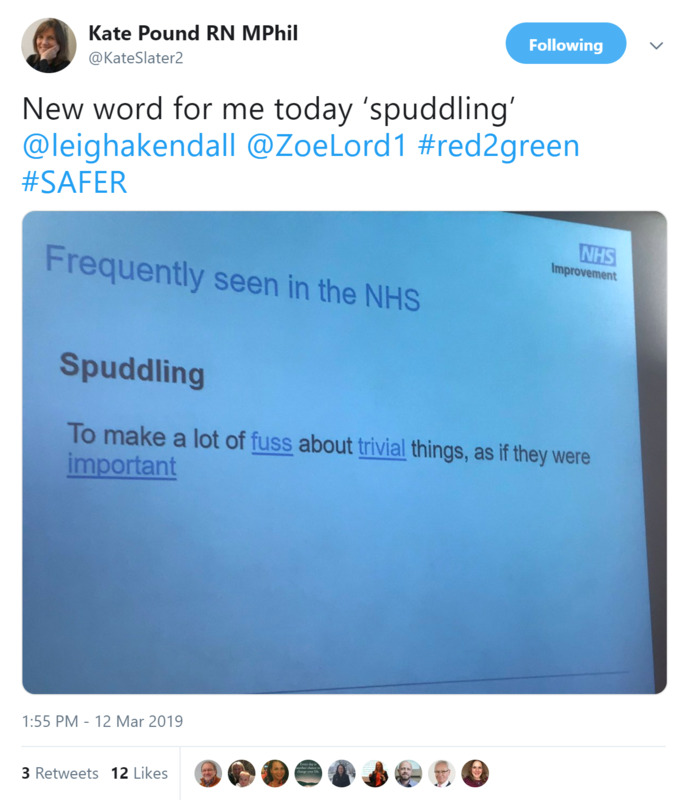 Find out in Kathryn's post! 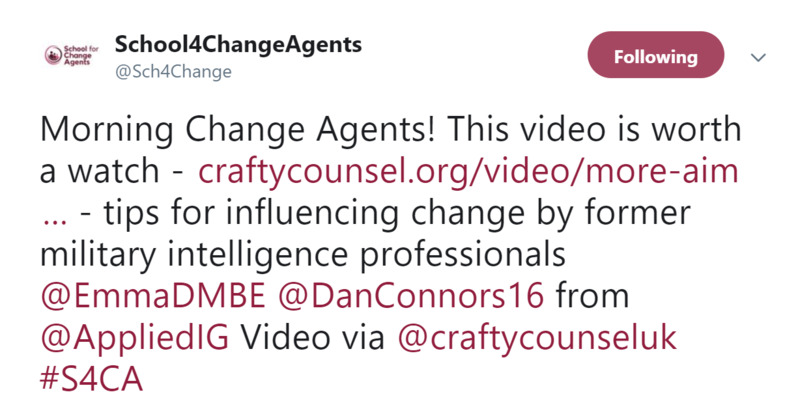 A lecture that our community might be interested in: How Change happens. 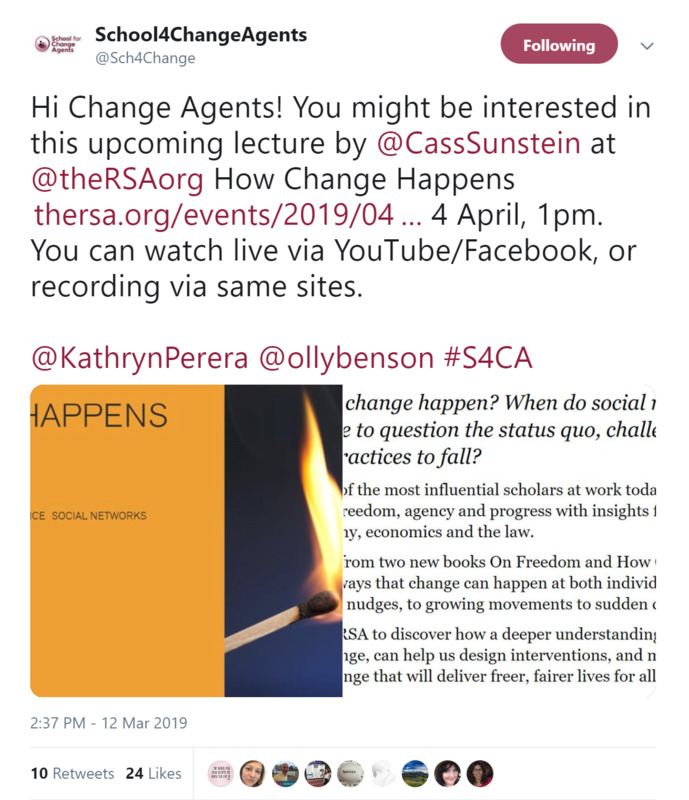 It will be broadcast on April 4th at 1pm, or the recording will be available afterwards. 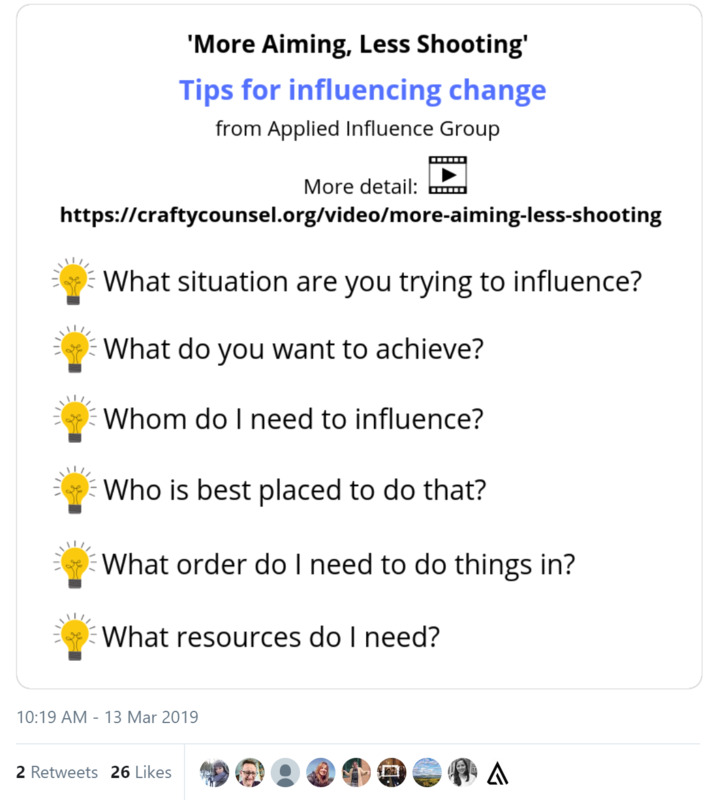 More aiming and less shooting: a video with lots of tips for influencing change. 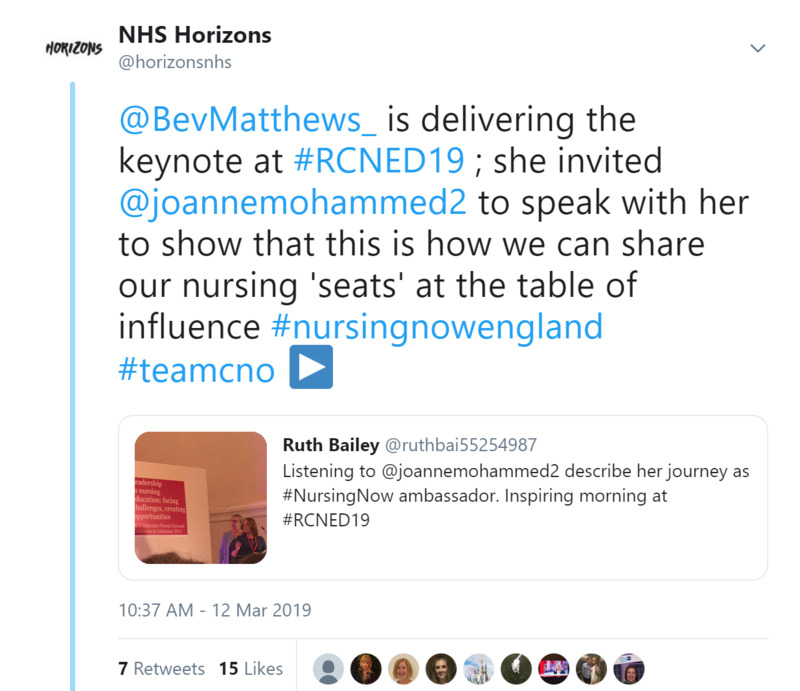 Bev co-presented the keynote session at the Royal College of Nursing Education Forum with Ambassador Joanne Mohammed. 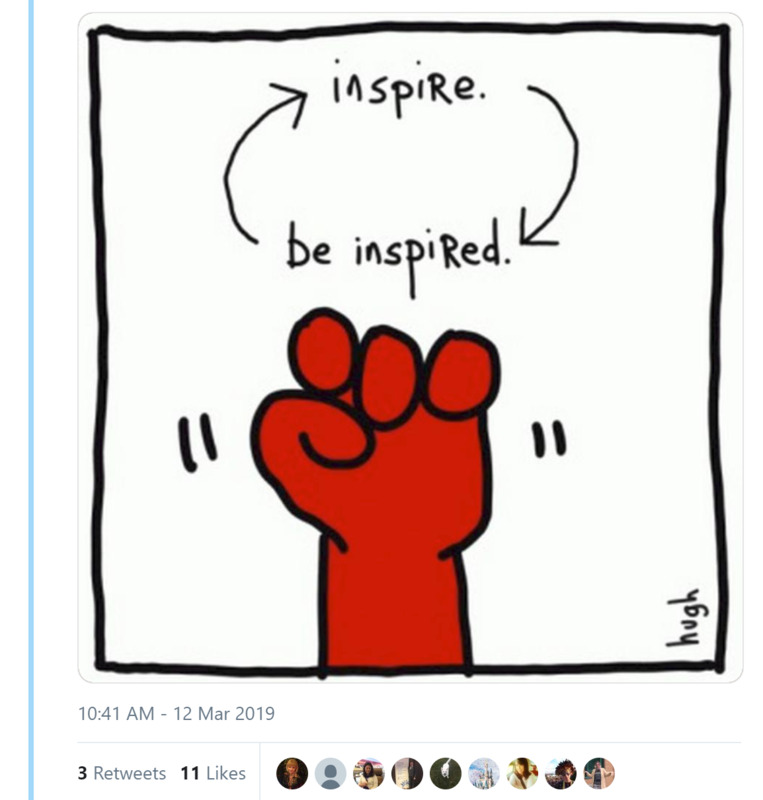 This shows how we can share space at the table of influence. 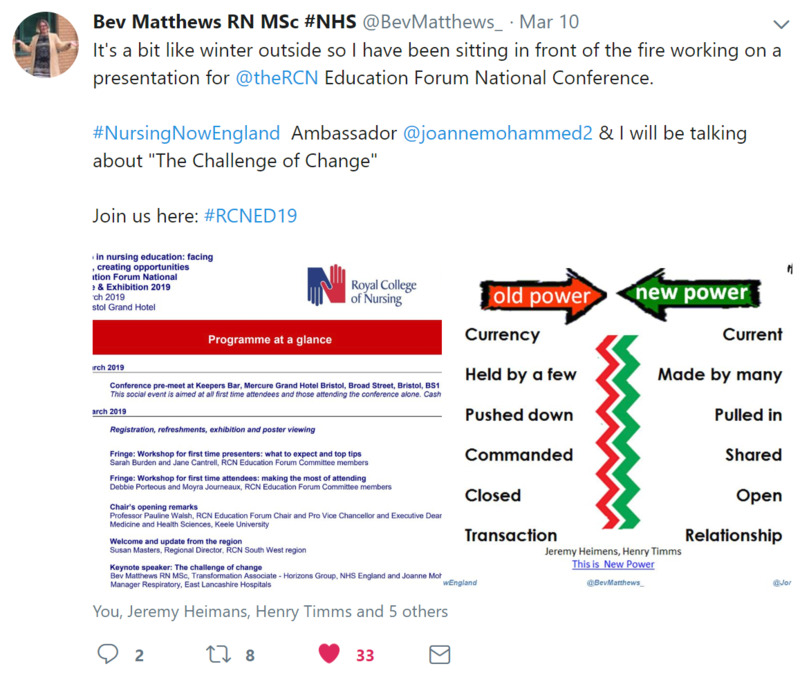 Bev and Joanne talked about 'The Challenge of Change'. 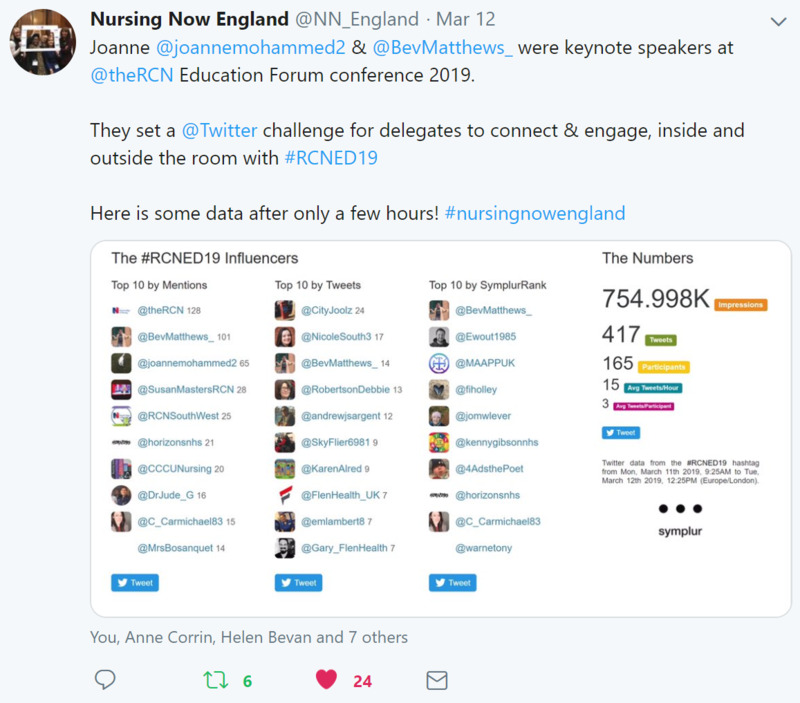 They set a Twitter challenge for delegates to connect and engage, inside and outside of the conference venue. 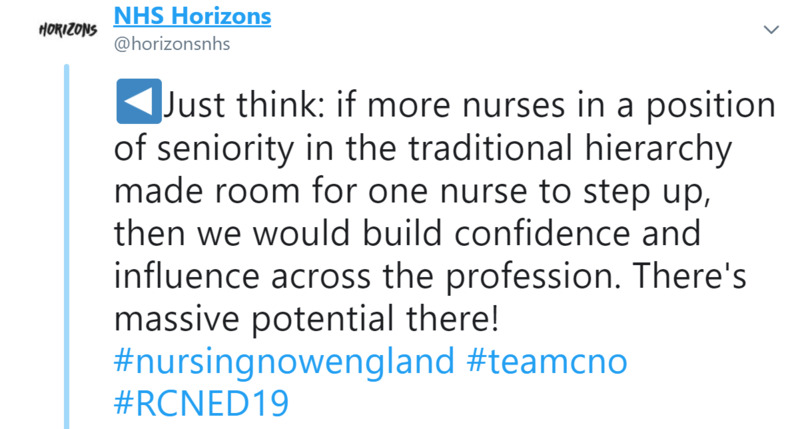 A call for all RCN members to join the Nursing Now England campaign. Sign up here. 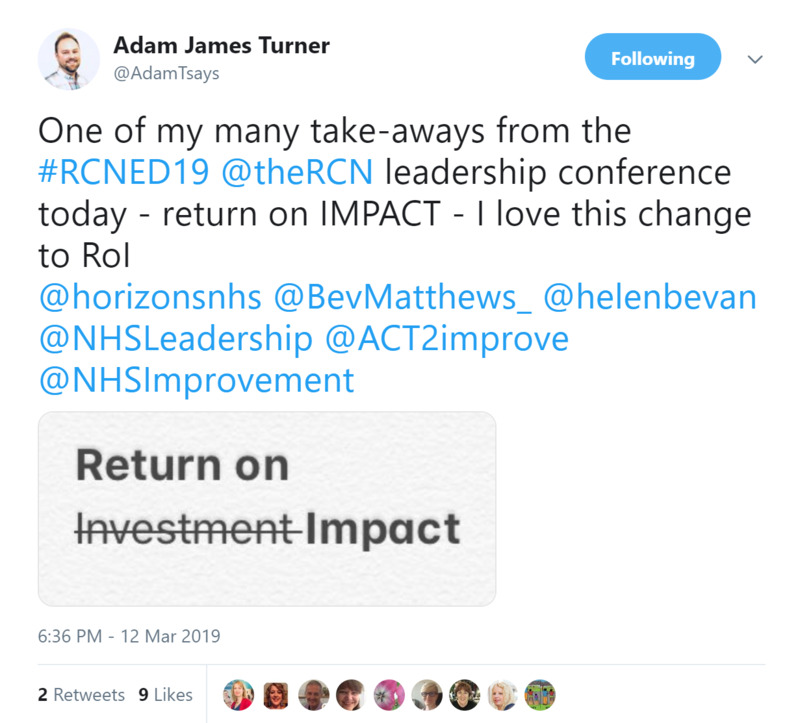 What we really need - return on impact. 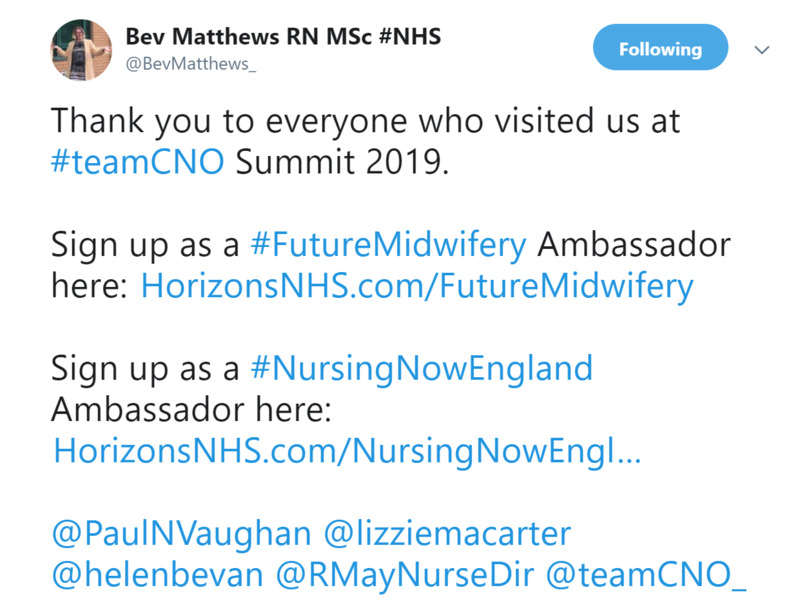 Our ambassador network has now engaged with more than 70,000 staff. It's truly a great accomplishment. 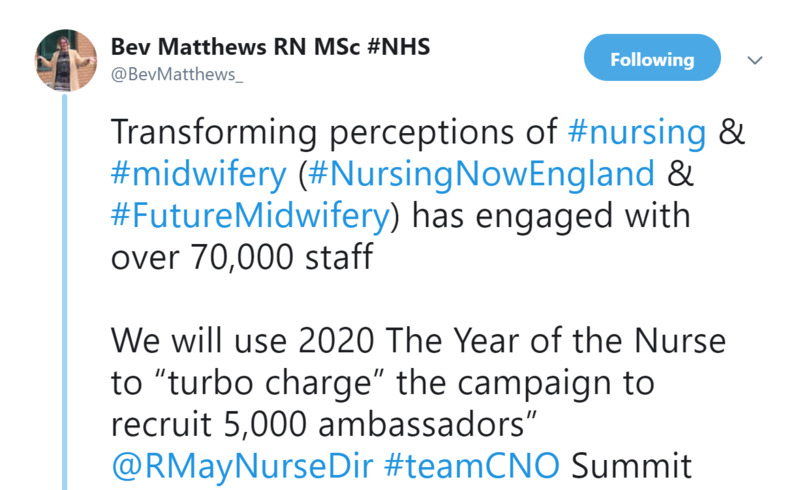 "We will use 2020 The Year of the Nurse to “turbo charge” the campaign to recruit 5,000 ambassadors” , said Ruth May, the Chief Nursing Officer, at #teamCNO Summit. 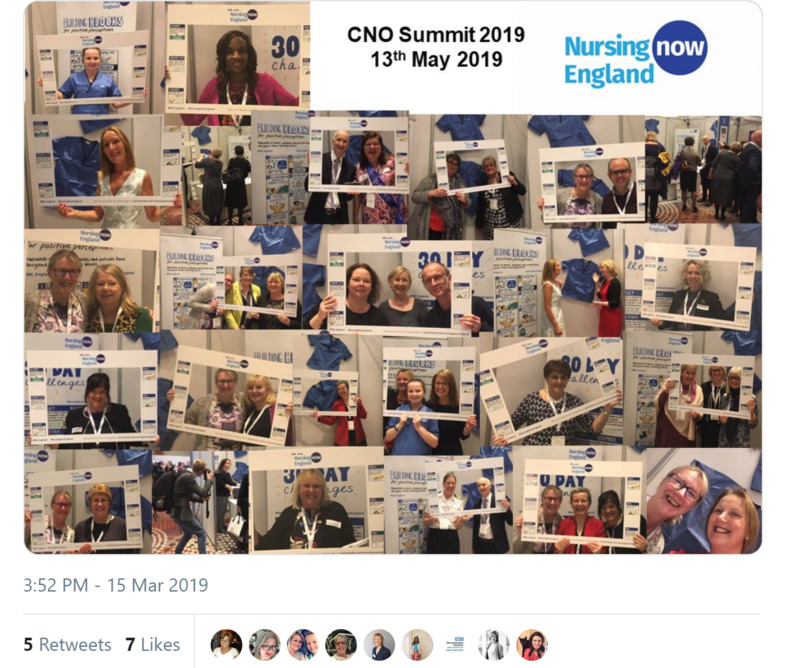 Thank you to everyone who took the time to visit the stand at the CNO Summit this week. 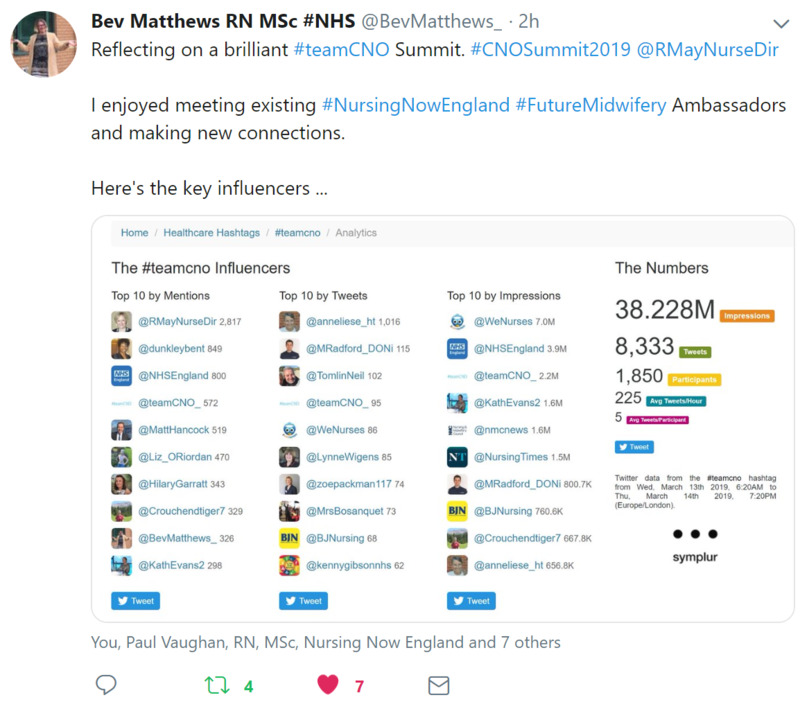 The key influencers at the CNO Summit this week. 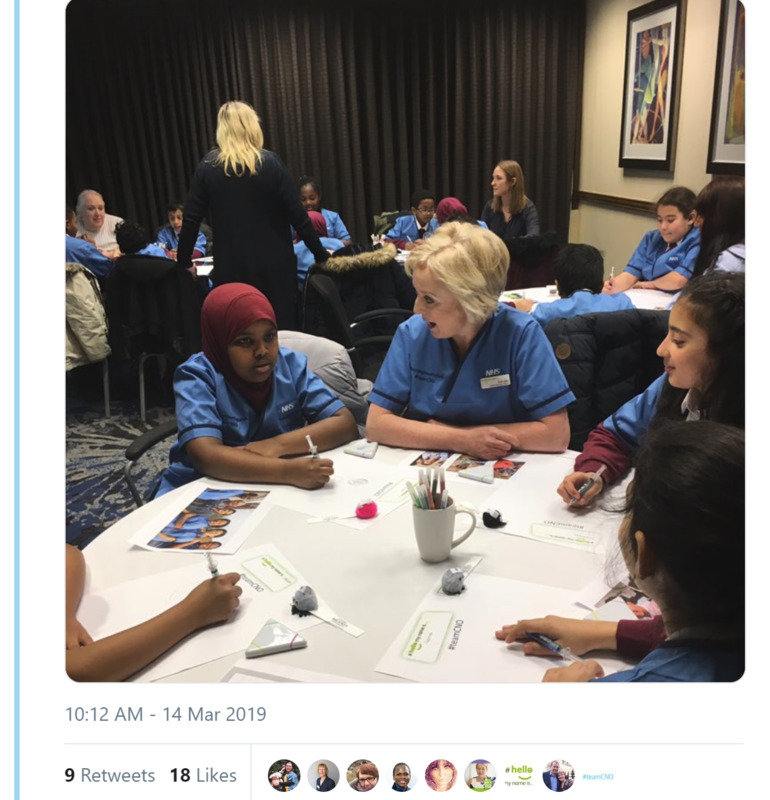 Pupils from Percy Shurmer School attended the CNO Summit to formally launch the gender-neutral mini uniforms. 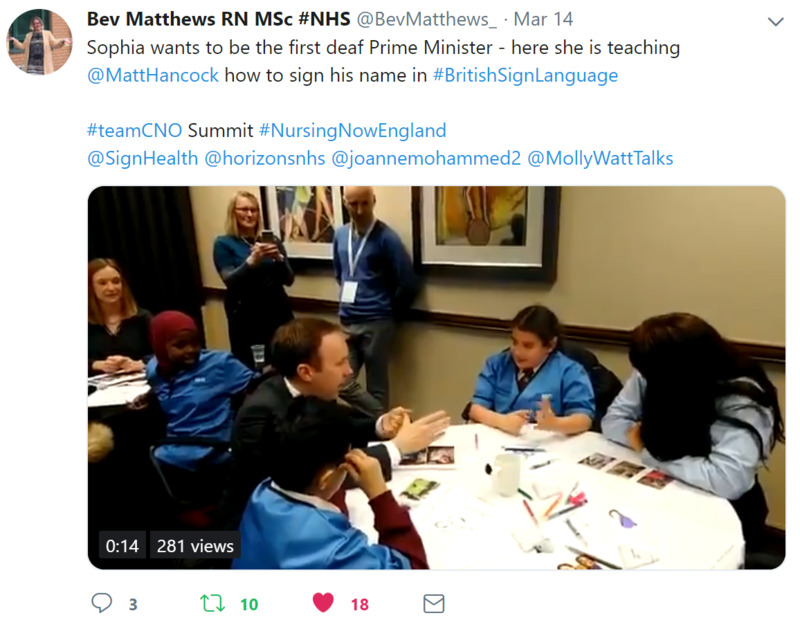 Sophia taught Secretary of State for Health Matt Hancock to sign his name in British Sign Language. 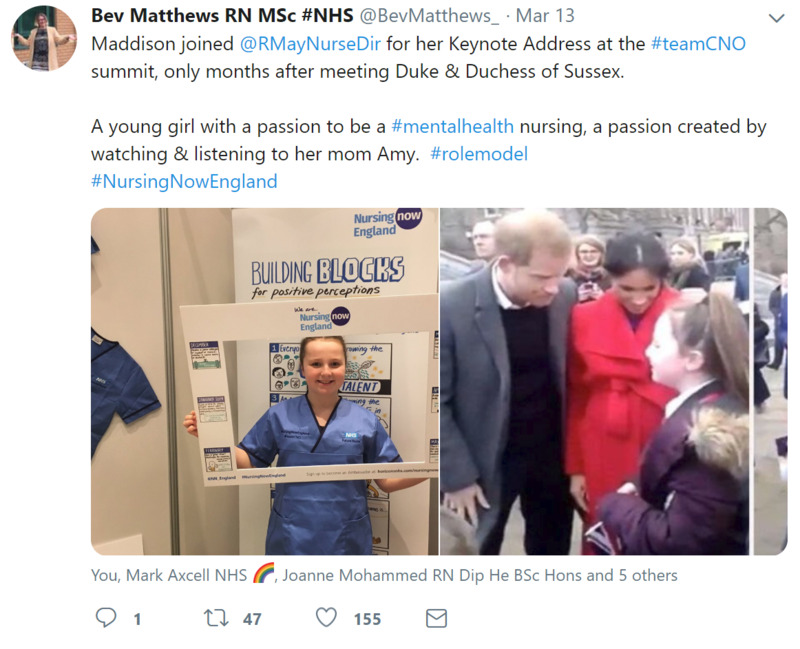 Maddison, a young girl with a passion to be a mental health nurse also joined the summit to share her passion. 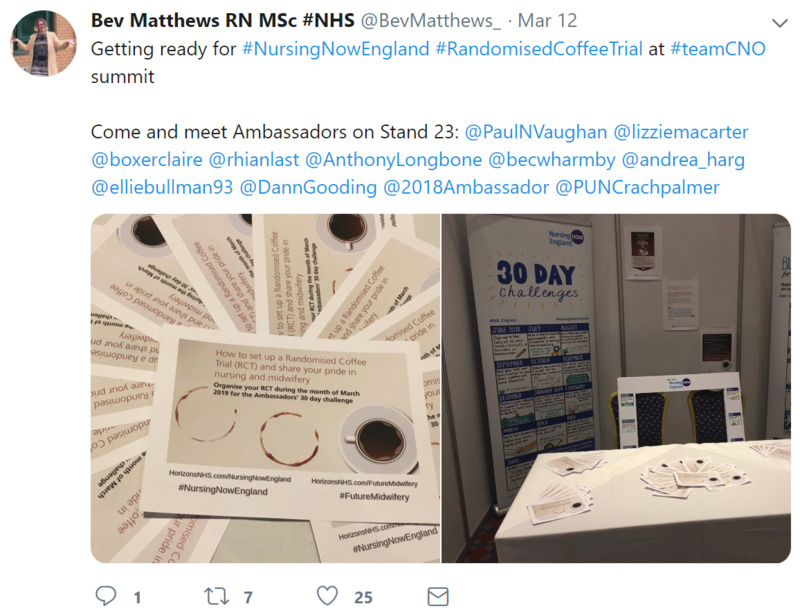 Randomised Coffee Trials are the March challenge - find out more. 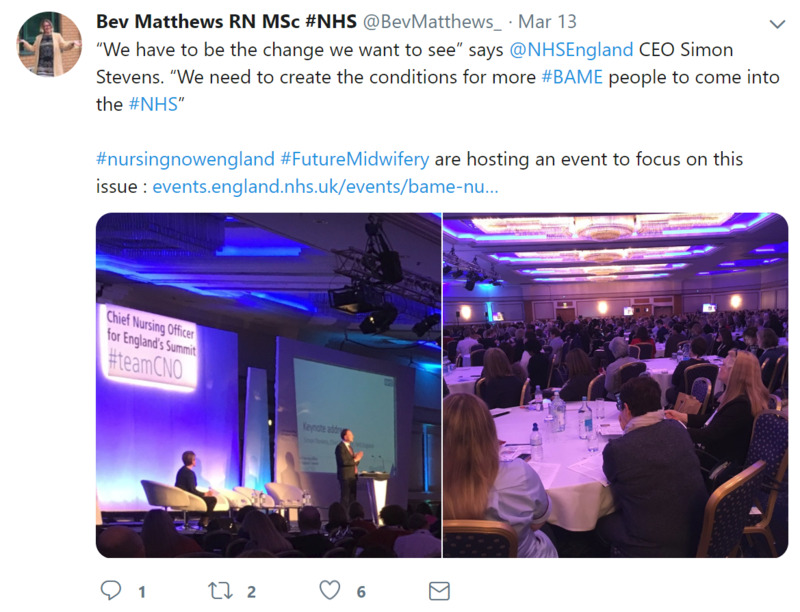 "We have to be the change we want to see"...says Simon Stevens, CEO of NHS England about creating the conditions for more BAME people to come in to the NHS. 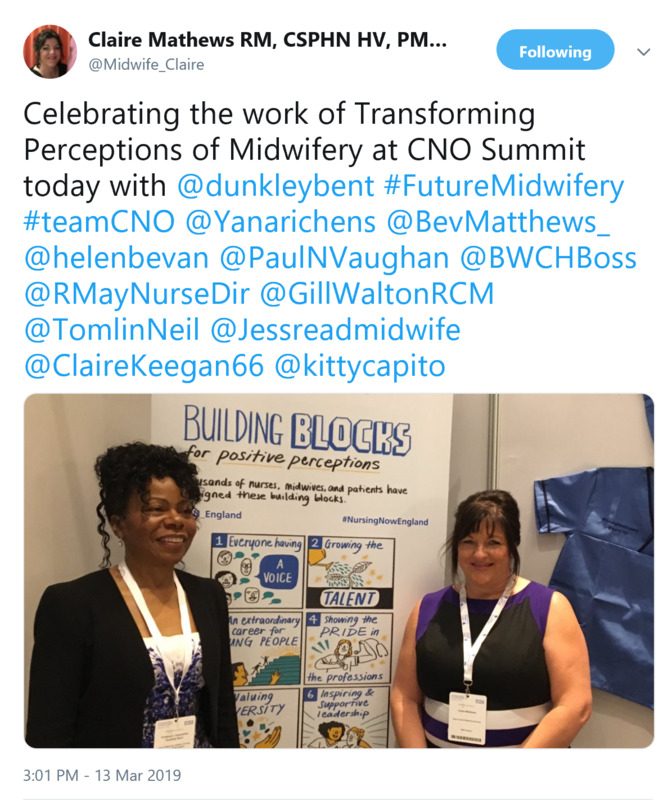 Professor Jacqueline Dunkely-Bent OBE was announced as @NHSEngland first Chief Midwifery Officer for England at the #teamCNO summit by Simon Stevens, a great development for #FutureMidwifery. 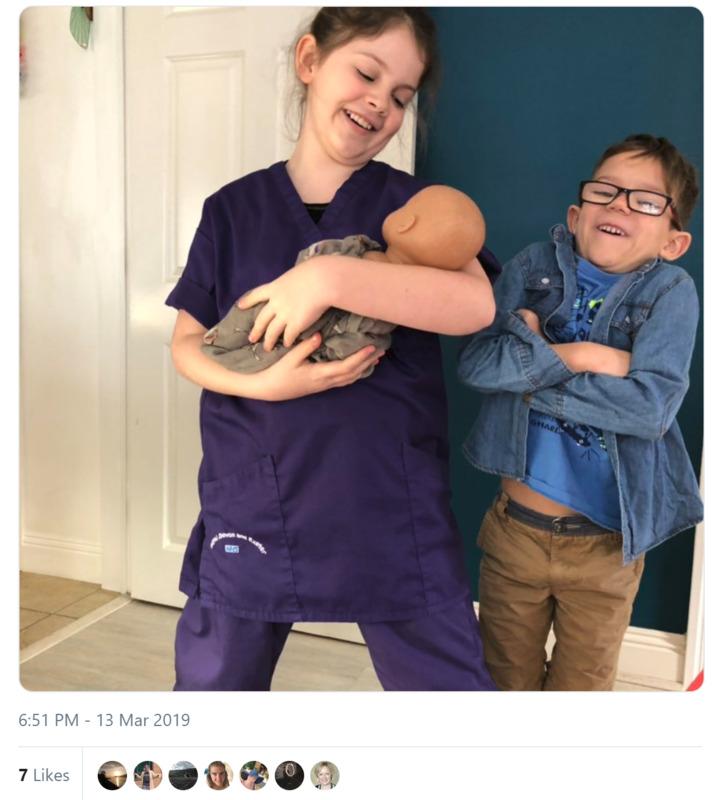 A midwifery ambassador's daughter dressed up as a midwife for a dance show! 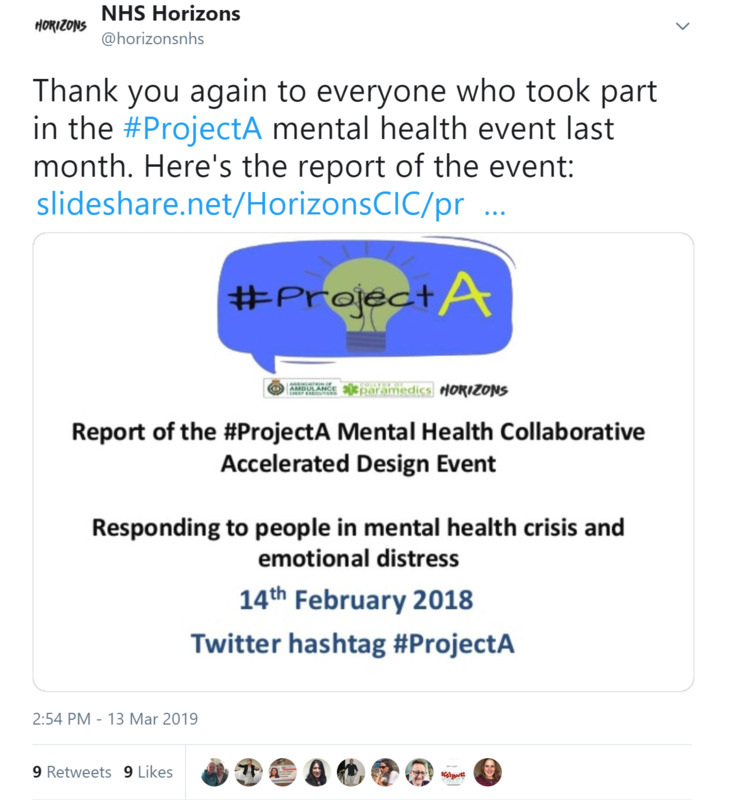 Thank you again to everyone who took part in the #ProjectA mental health event last month. 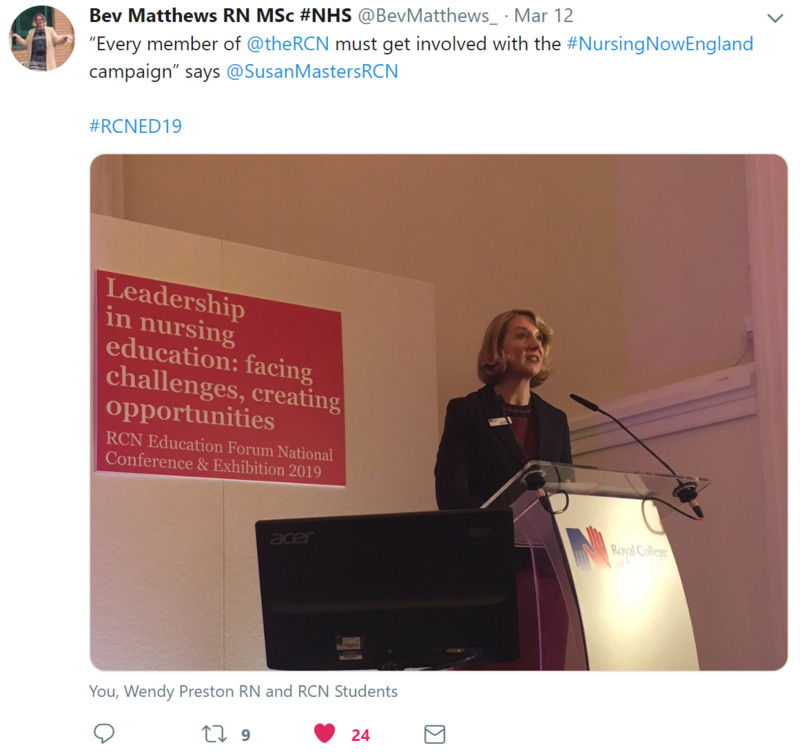 The report of the event is available here. 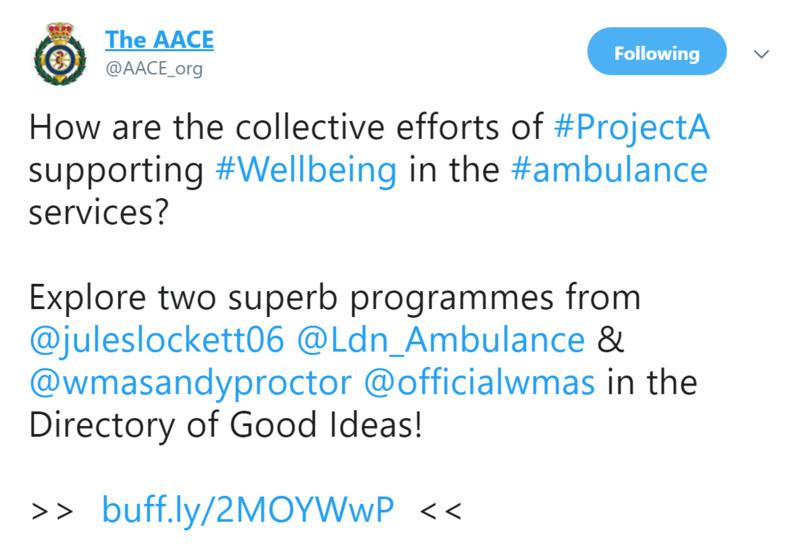 Find out how the collective efforts of #ProjectA are supporting wellbeing in the ambulance services in the Directory of Good Ideas. 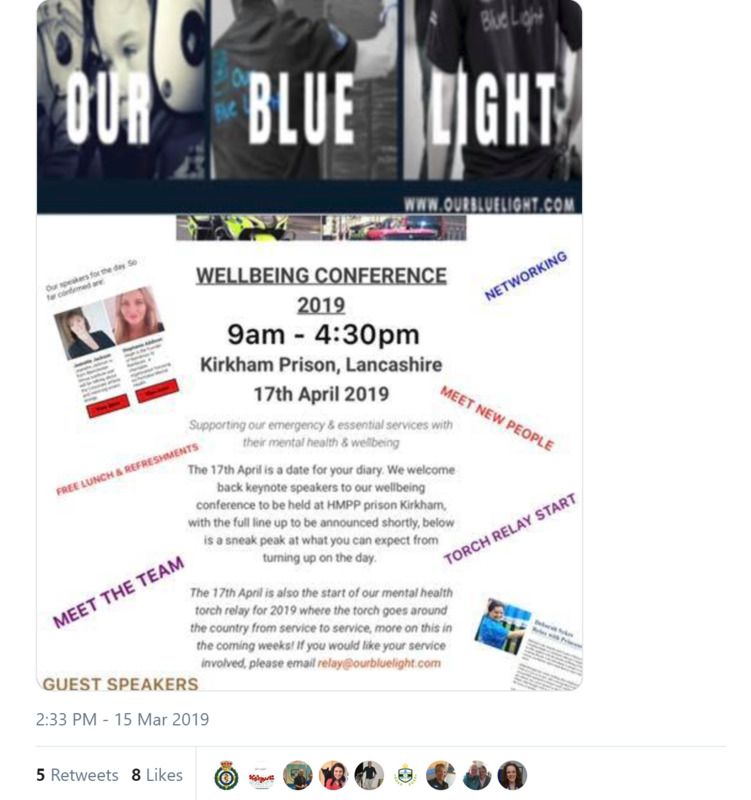 Ian has been engaging with Our Blue Light, linking up their work with #ProjectA. 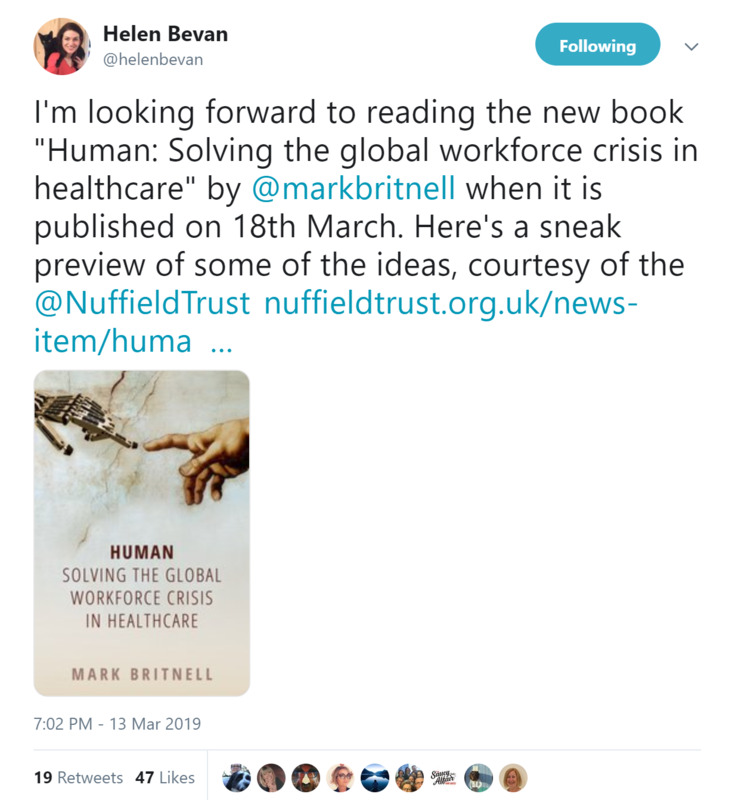 A sneak preview of some of the ideas in the new book: Human: Solving the global workforce crisis in health care. 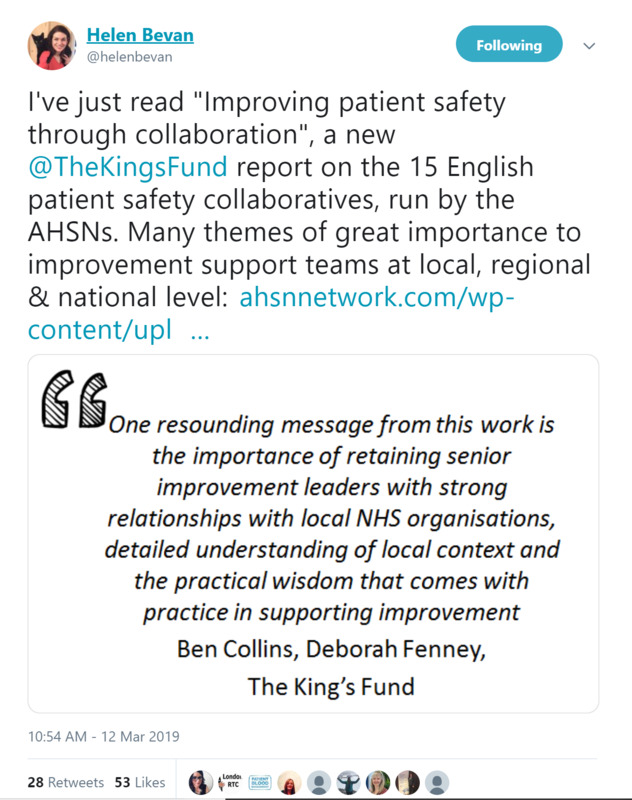 "Improving patient safety through collaboration" is a new @TheKingsFund report on the 15 English patient safety collaboratives, run by the AHSNs. 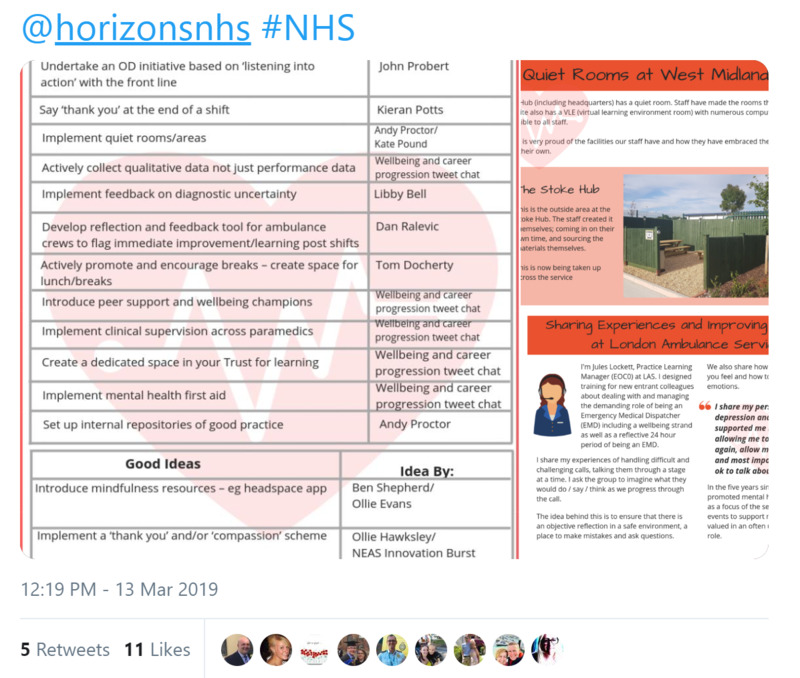 Many themes of great importance to improvement support teams at local, regional & national level. 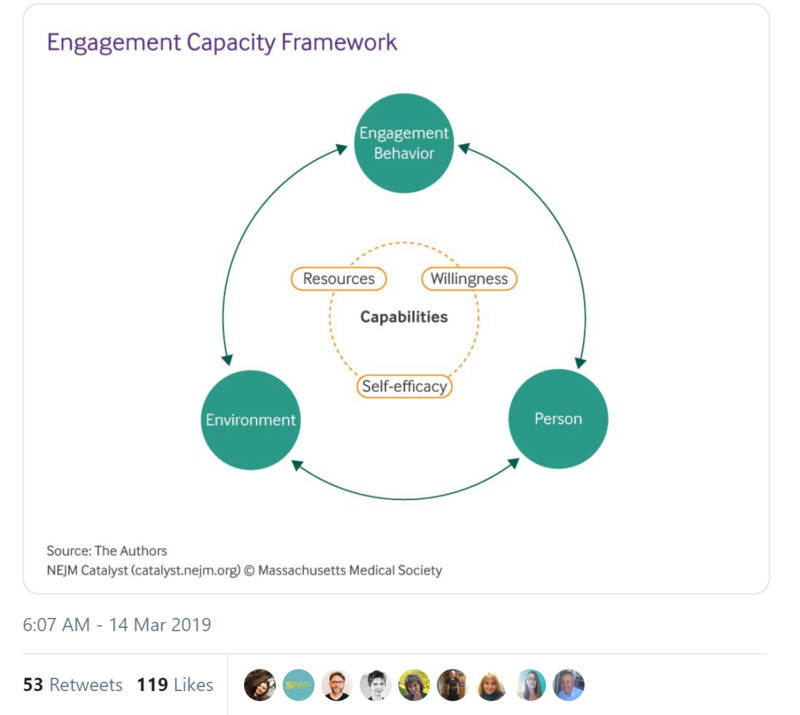 What Factors Determine a Patient’s Ability to Engage? 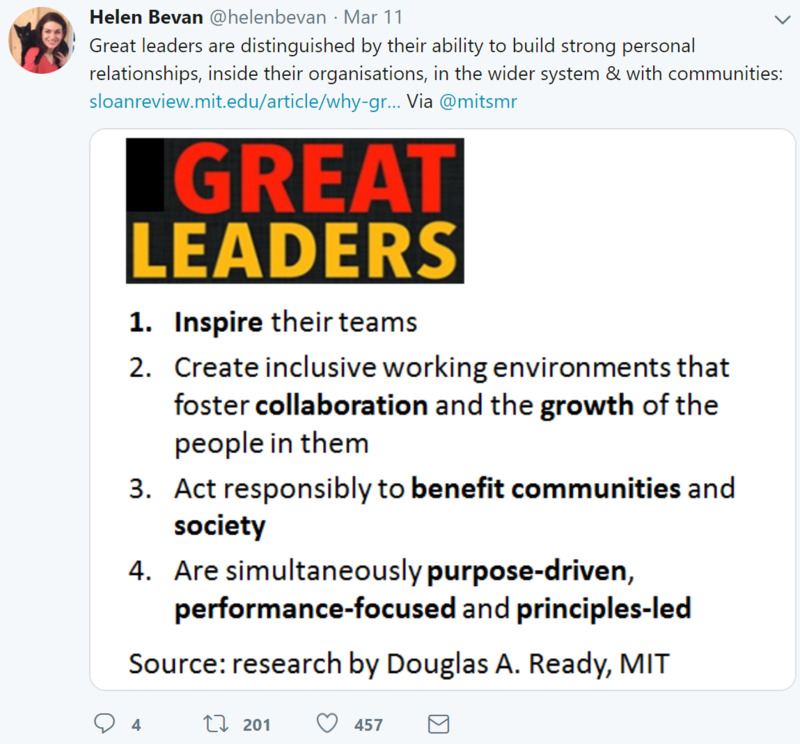 Great leaders are distinguished by their ability to build strong personal relationships, inside their organisations, in the wider system & with communities. 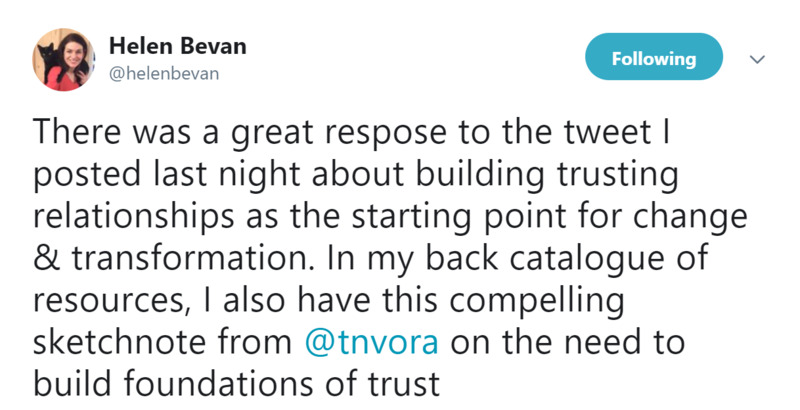 In response to Helen's discussion on building trust as foundation, Ian also recommend another great article: Connect, Then Lead.